For an email marketer, there is nothing sadder in the this world than hitting send and hearing complete silence: dismal open rates that lead to low engagement, and ultimately time wasted on a campaign that doesn’t move the needle. If this is your worst nightmare (and it should be), it’s time to re-evaluate the language you’re using in your email subject lines. We teamed up with Grammarly to poll their blog readers about their most-hated and most-loved subject lines. Here are their comments, insights and how you can craft a subject line that boosts open rates. Not surprisingly, the biggest subject line faux-pas amongst the Grammarly audience was spelling and grammatical errors, which irked 35% of people. Try this: Proofreading is everything when it comes to avoiding grammatical errors. Get a second pair of eyes on your work to get new perspective. You can also try a tool like this one that automatically checks for spelling and grammar mistakes in your emails. Following closely behind was subject lines in all caps at 24%. There’s no question that using all caps is a one-way ticket to a mass unsubscribe exodus. Try this: Want to draw attention in the inbox without annoying your subscribers? Try using emojis in your subject line. They won’t work for all audiences, so it’s important to test and see if emojis resonate with your subscribers. Learn more about incorporating emojis into your emails here. Unnecessary punctuation, sales-y language and broken personalization – oh my! 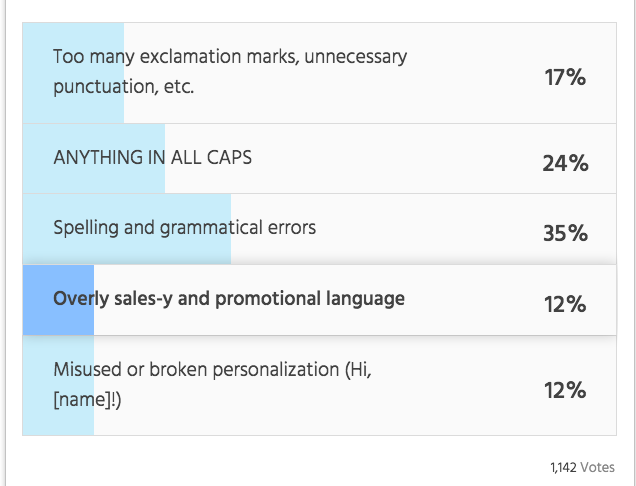 Next up is unnecessary punctuation (like too many exclamation points) at 17%, followed by overly sales-y language and broken personalization, coming in at 12% each. All of these tactics are commonly used by spammers, so it’s no wonder why so many people are peeved by them. Grammarly’s readers have certainly received their share of subject lines containing the aforementioned faux-pas. Here are a few they really can’t stand. Try this: Remember, email is personal. The language you use in your subject line should feel natural, not sales-y or robotic. Avoid jargon in your subject line whenever possible. And the winner is… relevancy! 50% of Grammarly’s followers want to be able to scan a subject line and know what the email is about right away. Subject lines lacking the actual subject of the email are deal-breakers. That means your subject line needs to be concise and relevant. As a business, how can you make that happen? When it comes to your subject line, one of the best ways to gain more opens is making sure your subject line directly pertains to the email content inside. This lets your subscribers know right away what your email is about, and will encourage them to open and click-through faster. Be your own fitness hero. Today only: 50% off sneakers. Sure, the first option is more whimsical and creative, but it doesn’t say anything about the sale I’m promoting. If I want people to click-through and take advantage of the sale, the second option has a better chance of making that happen. This won’t always be the case, though, which is why A/B split testing your subject lines is so important. Try this: Real-time A/B testing lets you test two email subject lines. When one outperforms the other, it automatically sends the winning subject line to all of your remaining recipients. Learn more about how real-time testing gets better results. Getting your emails opened is biggest – and arguably most important – first step of running a successful email campaign. Creating subject lines that resonate with your audience is a big part delivering a contextual experience with email, so test out some of the tips listed here before you hit send on your next campaign. This entry was posted in Email Marketing and tagged email content, subject lines on August 18, 2016 by Kristen Dunleavy.